One shock was negative: Cuba’s main international commercial partners — Venezuela, Brazil, China —have lost their appetites for subsidizing the anemic Cuban economy, lending a new urgency to grow perennially lethargic exports, and forcing the Cuban authorities to look for new sources of foreign exchange. The second shock was positive: In the wake of the December 2014 rapprochement, the United States significantly relaxed restrictions on U.S. travel to the island, and prospective tourists in other nations saw Cuba in a new light. As a result, tourist arrivals jumped by over 16% in 2015 to 3.5 million. 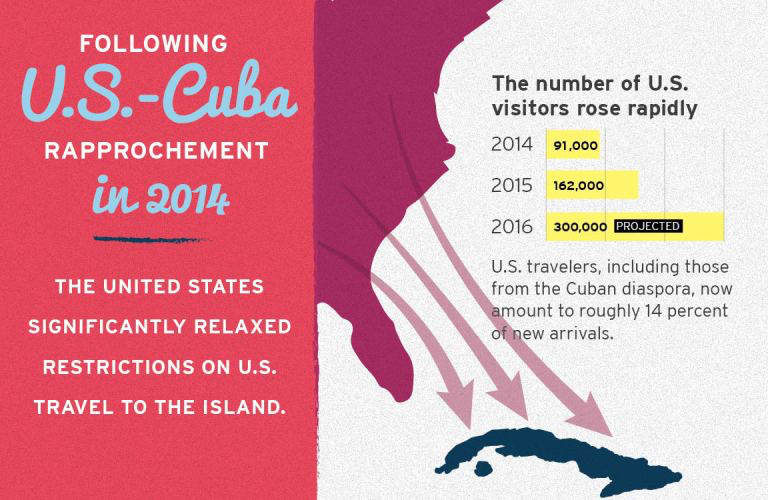 U.S. travelers, including those from the Cuban diaspora, now amount to roughly 14% of new arrivals, and are expected to nearly double in 2016. With lovely beaches, several UN historic sites, and a vibrant culture, the industry has enormous potential. 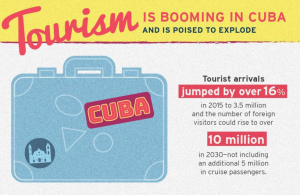 Moreover, Cuba still has a relatively low volume of tourists, and if properly managed could readily accommodate planned expansion and become a driver of rising incomes for the whole nation. 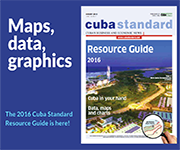 The industry already makes an important contribution to the Cuban economy. Both public and private workers in the industry benefit directly from employment and income, thousands of suppliers benefit from sales to the industry, and the emerging private businesses include tourism-centric B&Bs, taxi transport, and restaurants. However, the industry has progressively lagged behind other countries in the region in the quality of its offerings and services. Because of government-imposed restrictions on foreign trade, labor markets, and local purchases of inputs, Cuban earnings from the industry as a share of GDP are roughly half that of its Caribbean Basin neighbors, the Dominican Republic and Costa Rica. 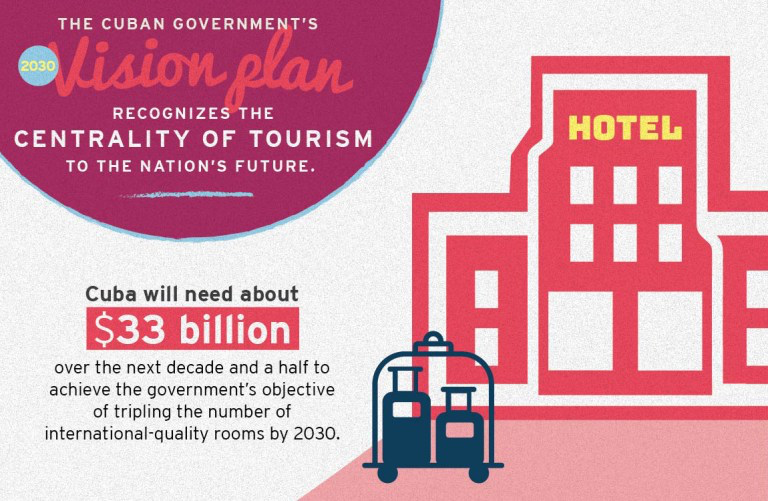 The government envisages boosting the number of visitors to over 10 million per year by 2030. It plans to add 108,000 new rooms, mainly in beach resorts and by relying on the internal cash flow of state-owned conglomerates. How feasible are these goals? Using industry norms, we estimate that Cuba would have to invest roughly $33 billion over 15 years to 2030 to achieve these targets — a massive sum in comparison to the overall size of the Cuban economy ($87 billion according to official sources). It seems unlikely that, given low domestic savings and current policies, the country can reach these ambitious goals. Three state-owned enterprises dominate the sector. The largest conglomerate, Gaviota, reports to the Ministry of Defense (MINFAR), and is responsible for about 25% of total rooms available to international tourists. While fully two-thirds of hotel rooms operate with foreign collaboration, most take the form of management contracts. Joint ventures with foreign equity are the exception rather than the rule. At the same time, private bed and breakfasts are rapidly growing, and now offer nearly one-quarter of available rooms. B&Bs have attracted sizeable foreign savings — by all accounts, mainly through remittances from relatives and friends — all the while maintaining legal ownership by domestic Cubans. These, together with private restaurants, private construction companies, and other tourist services, constitute a dynamic cluster of private enterprise that we estimate now amounts to about 30 percent of the tourism industry. •Rather than seek to fund nearly all of the planned investments in hotels from internal cash flow, the country could mobilize more foreign savings by welcoming greater foreign investment. For the hotel sector and broader industry (such as golf and other leisure activities), this requires establishing clearer rules to attract foreign investment and streamlining the overly discretionary approval processes that have delayed many long-gestating projects. 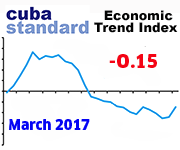 •The promising B&Bs sector could attract a surge in foreign exchange if Cubans were allowed to own more than one private dwelling. Simplifying the tax structure facing private firms and property owners would create incentives to save and invest. Amending the payroll tax system and regulations would encourage new jobs, not discourage them as they do now. •The government currently extracts resources from the tourism sector through a series of instruments that severely dampen growth. The most distortionary is the dual currency/dual exchange rate system. Progressively replacing this complex rationing system of foreign exchange with a modern trading system and a modern tax system would provide the state with valuable resources to invest in health, education, urban rehabilitation, and other priorities. New taxes could include a value-added tax (VAT) on hotels and tourist services, a property tax on assets, and corporate income taxes. •Revamping the pricing systems governing critical inputs, together with exchange rate reforms, would open the way for deepening the employment and linkage effects of the industry. While the government has taken steps to liberalize ancillary aspects of the industry—for example, restaurants and taxis — its efforts have been fitful and inconsistent, particularly in agriculture. Gradually phasing in market prices in food production, while retaining state stores to serve subsidized low-income groups, would provide incentives for farmers to expand supply, substitute for imports, and increase yields. 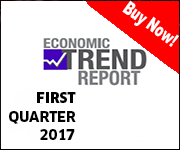 •All of this would entail a shift in strategy toward increasing quality and raising domestic value added. Cuba aspires to target more upscale markets, and this means investing in better quality service and facilities, and in more staff training. Rather than focusing so heavily on large resort complexes, Cuba might do better to also dot the island with smaller, more customized facilities, offering an eco-friendly and authentic experience. •Finally, a high priority is increasing connectivity. Cuba has already opened new air links. No less important is improving its Internet connectivity, both as part of efforts to provide a quality experience for visitors and to encourage management and financial transactions integral to first-class industry. •The United States should continue its willingness to support economic reform in Cuba, particularly through continuing liberalization of travel and commercial airline flights, promotion of telecommunications links, and greater openness in financial transactions. •The U.S. government could provide a general license for U.S. firms to engage in the tourism sector and to engage in management contracts and joint ventures. It is contradictory to allow a surge in U.S. visitors without allowing U.S. businesses to help to construct the associated infrastructure and services. •The United States should encourage Cuba to engage with international financial institutions, recognizing that such engagement brings new responsibilities along with access to new information, knowledge, and eventually finance. •To advance sustainability practices, encourage U.S. hotel chains and investors to follow high-quality corporate social responsibility practices. As part of this, facilitating partnerships between environmental NGOs and Cuban counterparts as well as between the U.S. National Park Service, Environmental Protection Agency, and other U.S. agencies with management skills and technology the Cuban government lacks can contribute to preserving the environment in the Caribbean Basin. 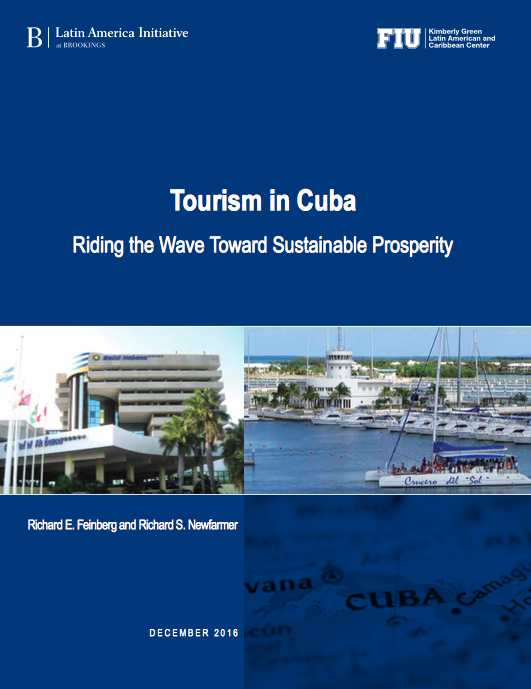 First, Cuban-Americans and other U.S. citizens that meet certain carefully delineated criteria to visit Cuba are accelerating the development of individual and family entrepreneurs that comprise the vibrant private tourism cluster — whose expansion is clearly in the U.S. national interest — as well as increasing income of workers throughout the tourism sector. Third, re-imposing restrictions on American visitors or private commerce may reduce tourist earnings —at the cost of hurting ordinary Cubans — but it will have limited impact on the course of the industry’s expansion because Europeans, Latin Americans, and others will continue their deepening engagement with the Cuban economy. Richard E. Feinberg is a nonresident Senior Fellow at Brookings Institution. Richard S. Newfarmer is country director Rwanda, Uganda and South Sudanat the Internaional Growth Centre. 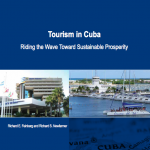 This version has been adapted from the December 2016 policy report ‘Tourism in Cuba: Riding the Wave Toward Sustainable Prosperity‘ published by the Brookings Institution and Florida International University. This entry was posted on Friday, December 9th, 2016 at 2:52 pm	and is filed under Economy. You can follow any responses to this entry through the RSS 2.0 feed. Both comments and pings are currently closed.